Following a similar ban that took place in Scotland in 2012, and promised in England in the Queen’s Speech last year, the Welsh government has pledged to ban letting fees by landlords and letting agents. Of those involved in the consultation, 91% of tenants said they had been charged fees to rent their home, with the largest fees being charged by letting agents. The new Renting Homes (Fees, etc) (Wales) Bill will prohibit landlords and letting agents from charging fees to private tenants for additional items such as viewing properties, renewing a tenancy, signing a contract or receiving an inventory. Under the new rules in Wales, landlords and letting agents will no longer be permitted to charge fees except those relating directly to tenancy deposits, tenancy breaches and rent. The penalty for breaching the rules will be a fixed penalty of £500, together with unlimited fines and the possibility of losing the landlord’s licence. Like the rest of the UK, Wales has seen an increase in private rental demand. The number of private rented homes in Wales more than doubled between 2001 and 2015, and now accounts for 15% of all housing. That figure is predicted to increase further in the next twenty years, and the number of households will increase at a faster rate than growth in the overall population. The new Bill aims to make privately rented property fairer for tenants of private landlords, and the Welsh government has said it expects ‘high standards, fair treatment and transparency’. The upfront fees charged by landlords and letting agents to tenants when they begin renting a home or to end a tenancy have often been significant. The ban aims to give tenants more mobility, allowing people to move more easily to accommodation that is cheaper, or closer to family, work, support structures or facilities. The government acknowledged the potential that banning fees may contribute to an increase in rents, which would be problematic for those tenants reliant on renting property close to the Local Housing Allowance rate for their area or property size, effectively excluding them from the market due to their economic status. Critics of the ban have pointed out that renting will, as a result, become more expensive for tenants, as landlords recoup the loss of their upfront costs with increased rents. In its impact assessment, the Welsh government said this was preferable to landlords charging fees as it offered improved transparency that facilitated comparability between options and tenants. 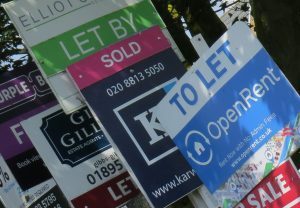 The government also saw it as the equivalent of an additional tax on landlords that would encourage them to sell property which overall would exert downward pressure on the speed of growth in the private rented sector.